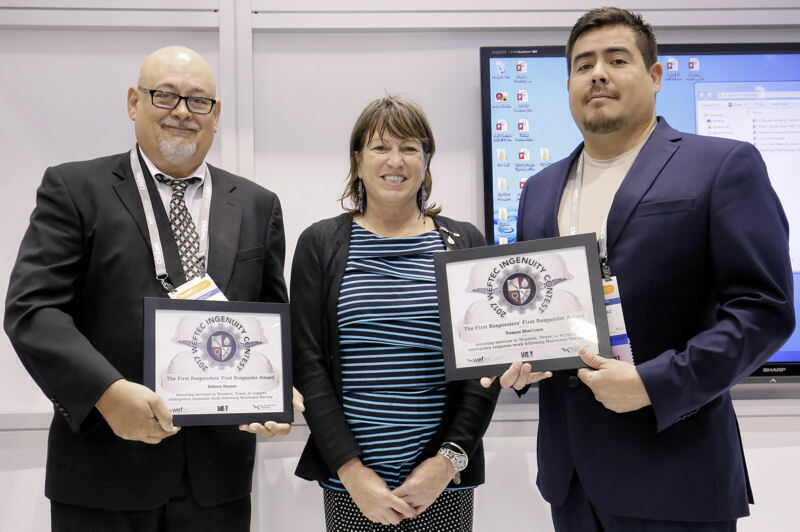 City of Houston operators Sidney Bomer (left) and Tomas Martinez (right) received he First Responders’ First Responder Award from Joan Hawley, member of the WEF Board of Trustees, during WEFTEC 2017. Photo courtesy of Oscar & Associates. Two City of Houston operators received special recognition during WEFTEC 2017. During Session No. 533, Operator Excellence: Operations Ingenuity Contest Winners, the Water Environment Federation (WEF; Alexandria, Va.) presented Tomas Martinez and Sidney Bomer with The First Responders’ First Responder Award. During the session, WEF celebrated winners of its sixth annual Operator Ingenuity Contest. They were recognized for devising simple yet inventive solutions to various problems encountered at work. This year, WEF decided gave out two extra awards for operators who helped to bring 39 of Houston’s water resource recovery facilities (WRRFs) back online quickly after Hurricane Harvey. Martinez and Bomer are both operations managers for the City of Houston Department of Public Works and Engineering. Martinez manages WRRFs in the northern part of the city while Bomer manages WRRFs in the southern part of the city. Martinez took the lead for preparation as his supervisor and Bomer were on vacation as the hurricane approached Houston. Martinez attended hurricane preparation meetings and disseminated information to staff, “stressing that safety was a priority,” he said. Flood-prone facilities were not manned to avoid personnel being trapped by rising water. He also “ordered staff to shut down blowers to save solids, prioritized work requests to bring facilities back online, and even delivered food one day for his people,” he said. When Bomer heard about the extent of the impending hurricane, he cut his vacation short. He arrived back at work before the hurricane made landfall. He made sure his staff “made early preparations to minimize the effects felt,” he said. The self-described hurricane veteran ensured that preparations included “topping off chemical tanks, reducing solids inventory, preparing staging locations, and making sure that staff developed their plans for around-the-clock shift work,” he said. Five of the 18 WRRFs located in Bomer’s territory were flooded by the hurricane. He put on hip-boots and walked several blocks to access one of the facilities. He helped coordinate an airboat rescue for personnel trapped inside a flooded building. He also coordinated food deliveries for his dedicated staff, Bomer said. After countless hours spread across many days, Houston’s many operators, supervisors, and support staff were able to bring their facilities back online. Throughout the hurricane, Martinez and Bomer offered their teams support and leadership. Together, these leaders and their teams reinstated wastewater treatment services to their citizens. 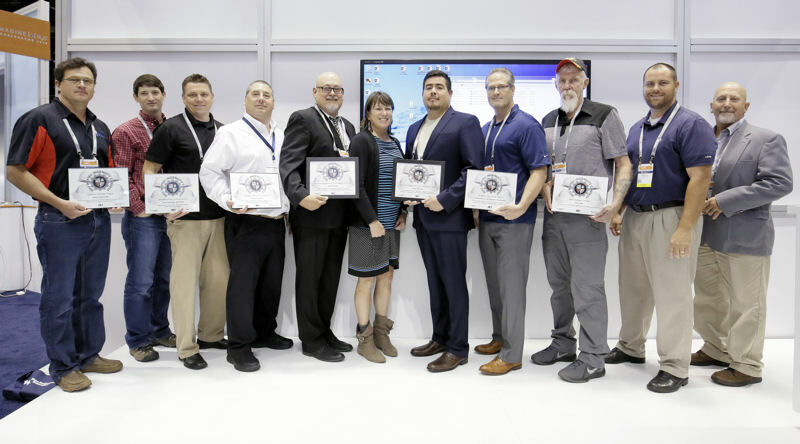 Hawley (center) stands with winners of the 2017 Operator Ingenuity Contest at WEFTEC including, from left, Andy Loudermilk, Matt Seib, Zenon Kochan, Mark Cataldo, Bomer, Martinez, Dave Dedian (who represented the Woodard & Curran winners), Tony Hale, Jason Patty, and Pat Fountain. Photo courtesy of Oscar & Associates. 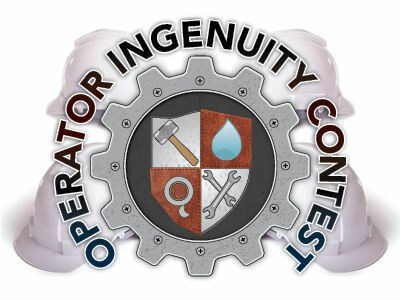 The Operator Ingenuity Contest showcases outstanding operations professionals and their ingenious ideas to solve problems. The winners and other selected entries will be featured in the Operator Ingenuity section of Water Environment & Technology magazine. Kevin Barry, Jeff Leonard, and Jim Wilson from Woodard & Curran (Portland, Maine) and the Pinehills Wastewater Treatment Facility (Plymouth, Mass. ).